How can you resist the crispy exterior of oven roasted vegetables with a creamy soft interior? The truth is that roasting any vegetable to the point of caramelization is what creates that irresistible sweetness. If you recall, this recipe for Roasted Root Vegetables as well as this recipe for Oven Baked Broccoli Fritters are two other great examples of this taste transformation. It truly is hard to resist oven baked vegetables when grilled to perfection. 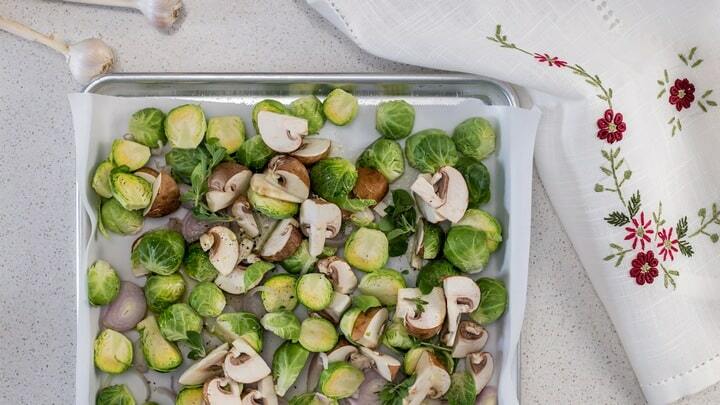 Brussels sprouts, mushrooms, shallots and garlic are all good vegetables to roast together. Let’s take a look at how to roast vegetables so that you can convert picky eaters into vegetable lovers. You won’t believe how easy this is! 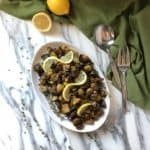 What do I need to make Oven Roasted Vegetables? Brussels Sprouts. One of the best veggies to roast in the oven. Garlic. Use as little or as much as you prefer. Olive oil. The use of extra virgin olive oil will make a difference. Thyme. This is a personal favorite with vegetables; feel free to use any other herb available to you. 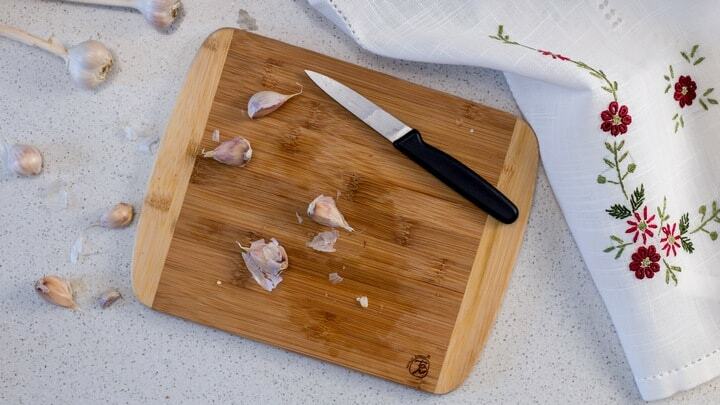 As far as kitchen accessories are concerned, you will need a sharp knife, a cutting board, and a large sheet pan. Parchment paper is optional. The first thing we are going to do is rinse the Brussels spouts. Then, simply trim about ¼ inch from the bottom and remove the outer leaves (these are great to make a vegetable stock with). 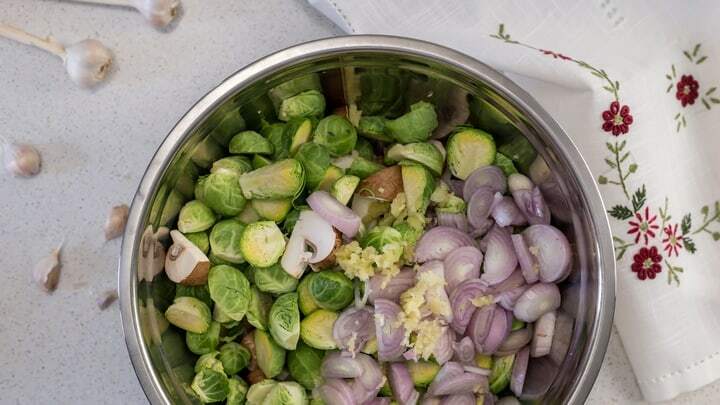 Cut the Brussels sprouts in half or in quarters if they are a bit larger. Remember, the smaller they are cut the more surface area to caramelize. 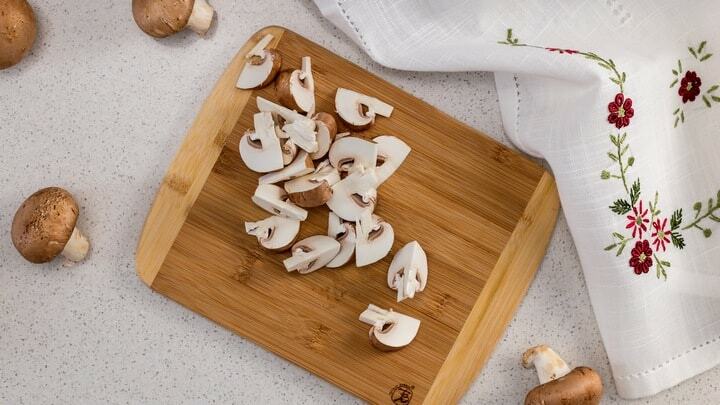 Next, let’s prep the mushrooms, by cutting in quarters or sixths. Once again, the overall size will determine how we cut them. 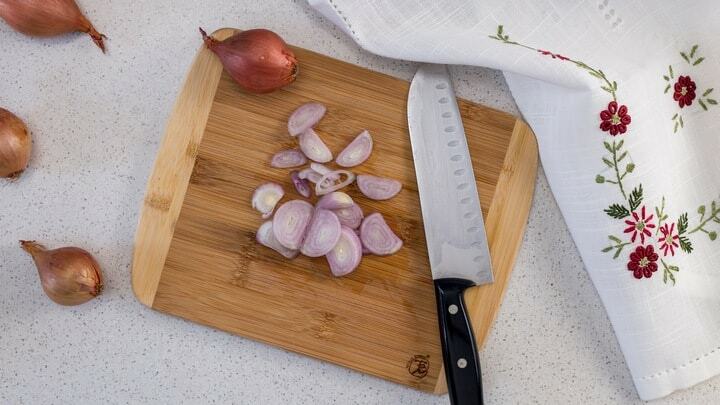 As you can see in the picture below, I like to slice my shallots. If you prefer, you can cut them in quarters. Finally, let’s get the garlic cleaned up. Depending on the size, I will sometimes use a whole head of garlic. 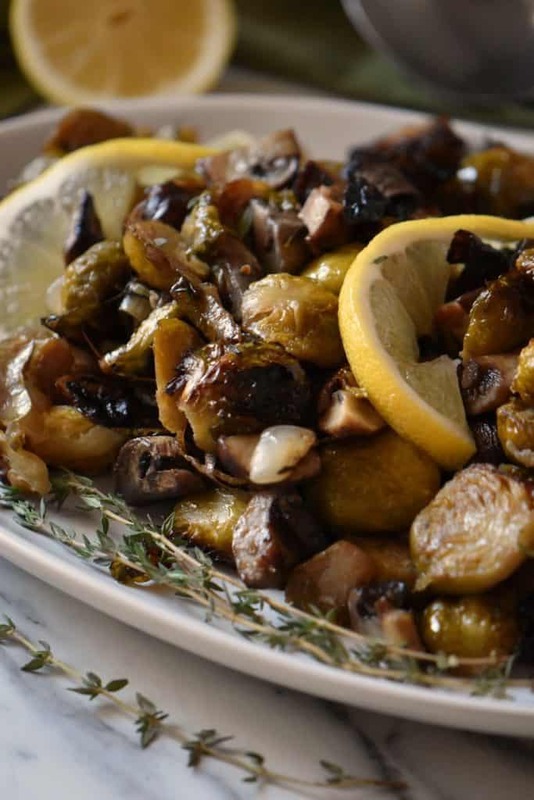 I like to mince my garlic when I make this oven roasted veggies recipe. If you prefer, you can also slice them thinly. Once all of the vegetables are prepped, toss them together and combine with olive oil, salt, pepper and herbs. Please note that this recipe yields a large amount of vegetables. The leftovers are great tossed with pasta. Next, spread the prepped vegetables out on a large sheet pan. Alternatively, you can combine the olive oil, herbs and spices directly on the sheet pan. 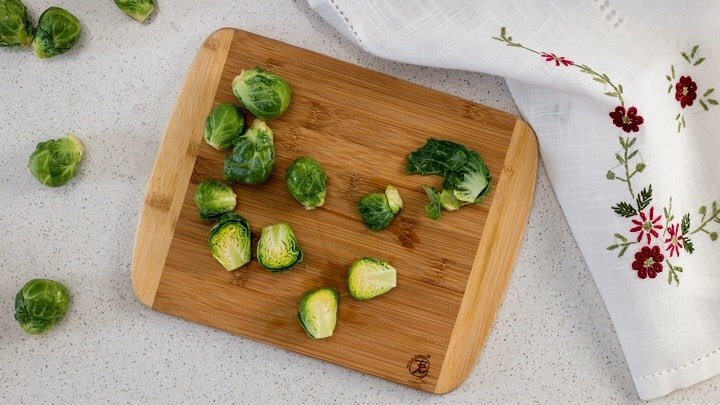 Although the use of parchment paper makes clean up a lot easier, for maximum crispiness, roast the vegetables directly on the sheet pan. If the vegetables are not spread out, they will not crisp up as much. If necessary, use two sheet pans. Mushrooms release a lot of moisture. Make sure to adjust total roasting time. Roast the vegetables in a 325°F (160°C) preheated oven for about 35-45 minutes or until they are almost done. The total time will vary based on the size you cut your vegetables. Stir them around a couple of times while they are roasting. Start taste testing at around 35 minutes. When they are almost done, increase the heat to 400°F (200°C) for about 10-15 minutes or until the vegetables begin to caramelize. 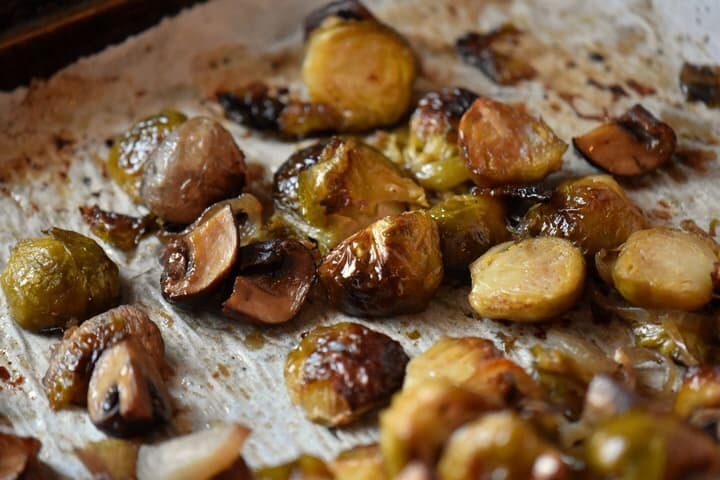 A few squirts of lemon juice and you are ready to serve your sheet pan roasted vegetables! Notice how the oven roasted mushrooms are perfectly caramelized! Use a large enough pan in order to spread the vegetables in a single layer. Do not overcrowd the pan.If necessary, use a second sheet pan. Increase the surface area of the vegetables by cutting them in half or quarters. The larger the area exposed to the heat, the greater the opportunity to provide maximum flavor. Stir the vegetables a few times while they are in the oven to allow the vegetables to caramelize evenly. The total roasting time can vary as this will depend on the size of the cut up vegetables. It is important to taste and adjust accordingly. The use of parchment paper is optional and will make the cleanup easier. Feel free to roast the vegetables directly on the sheet pan for maximum crispiness. Can the recipe be reduced? Yes, the recipe can easily be halved. I have been a fan of roasting vegetables ever since I learned about the process of caramelization in a food chemistry class way back when I was in university completing my dietetics degree. As you probably know, caramelization is the process of browning sugar with high heat. When we apply this process to the natural sugars found in vegetables, not only does this create a brown color and a crispy exterior, but also creates that desirable sweet and nutty flavor. 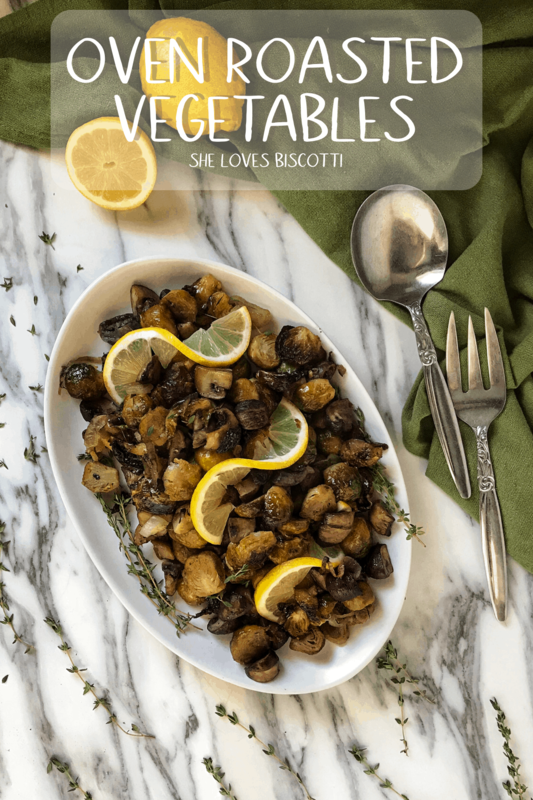 If you are a fan of healthy vegetable side dishes, you are going to love this recipe. You now have the best roasted vegetables recipe to complement any meal as it really is the perfect side dish. 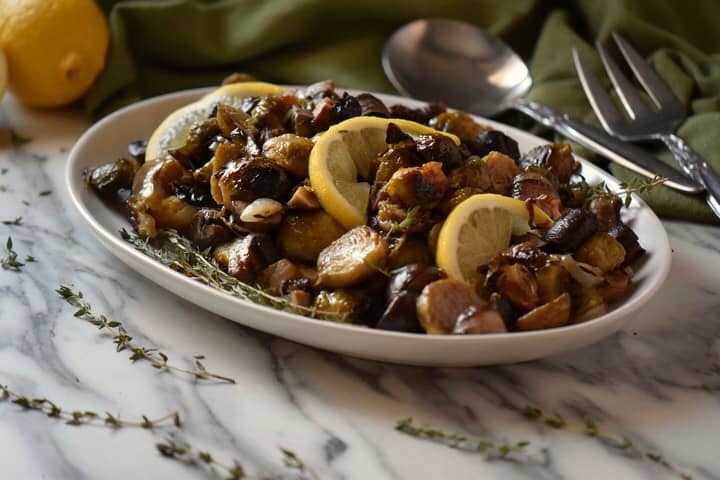 ★★★★★ If you have made this Oven Roasted Vegetables recipe, I would love to hear about it in the comments below and be sure to rate the recipe! Do you know how to make vegetables taste good? 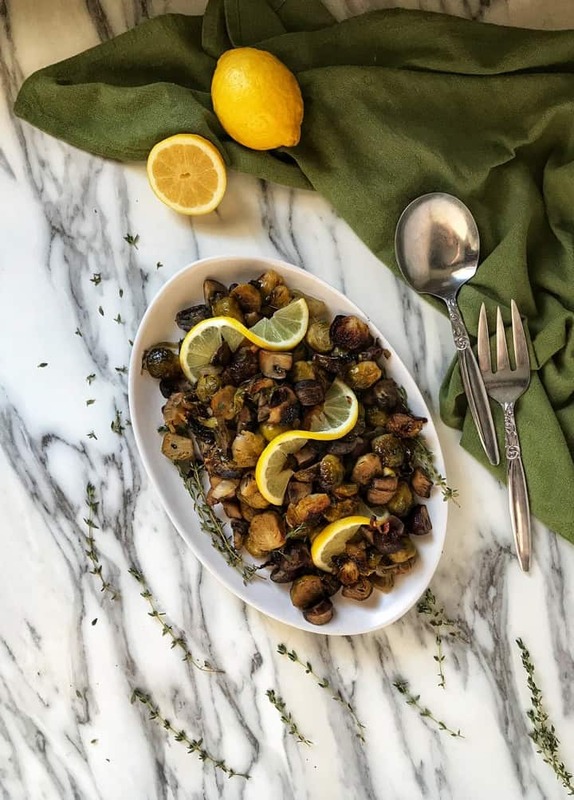 Make this recipe for Oven Roasted Vegetables and get ready to experience an incredible taste transformation. Position oven rack to lower third in the oven. Preheat oven to 325°F (160°C. Optional: Line a large baking sheet with parchment paper. Mix all the vegetables together with olive oil, salt, pepper and herbs. Place sheet pan in the oven for about 35-45 minutes. Increase heat to 400°F (200°C) for about 10 minutes or until vegetables are caramelized. Stir the vegetables a couple of times as they are roasting. Remove from oven and adjust seasonings. Optional: squirt with fresh lemon juice over the top. Place on serving platter and garnish with fresh herbs and lemon wedges. Increase the surface area of the vegetables by cutting them in half or quarters. The bigger the area exposed to the heat, the greater the opportunity to provide maximum flavor. Stir the vegetables a few times while they are in the oven to allow to the vegetables to caramelize evenly. The use of parchment paper is optional and will make the cleanup easier. Feel free to roast the vegetables directly on the pan for maximum crispiness. Total yield for this recipe is 5 cups. I love the combination of these oven roasted vegetables! Thanks for sharing Maria! A good flavor combination and the shallots get so nice and caramelized.